Cory is a sweet boy - smaller in size, like his Dam and with the same amazingly fine fleece AFD 17.5/ SD 3.5 / CV 20.0 /CF 99.9 - WOW! He's proven himself as a great obstacle boy - in September 2011 at the 4H show he and his handler took Grand Champion. Way to go Cory! Update Fall 2013: Cory went to live in Southern York Co with a group of boys. 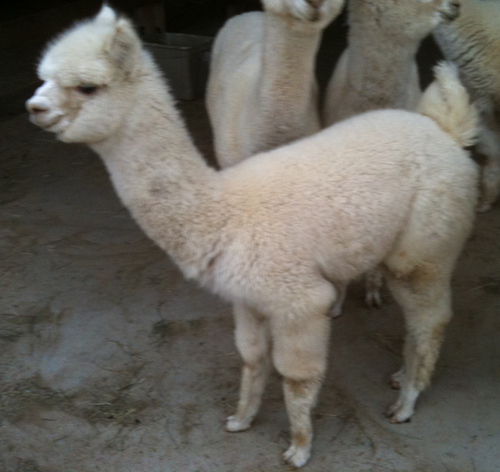 We loved Cory's fiber so much that we bred him once before he left to our true black girl Fiona. We won't see the results of that until fall 2014, but we are certainly anxious! Finnegan is growing fast and his fleece is probably one of the finest we've ever had on our farm. At shearing (5/11) his fiber stats were AFD 18.1/ SD 3.1 / CV 17.2 /CF 99.7. Not complaining about that! 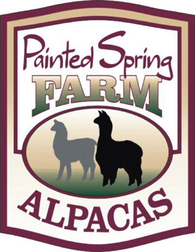 Update 6/14: Finnegan spent most of 2013 at the Morningstar Marketplace enjoying the bountiful grass in the solar field. He was back with us for shearing and he's turned out to be a nice solid young man with great fleece. 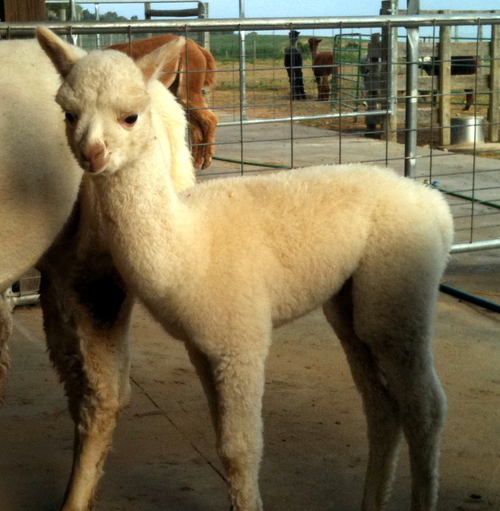 We were excited when our first cria of the fall was a girl. The first for us out of Elde - and what a dark color for a white sire. 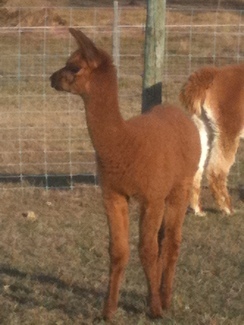 Ayla is tall and lean like her dam with dense fleece qualities like her mother. We are very pleased with the results of the pairing. 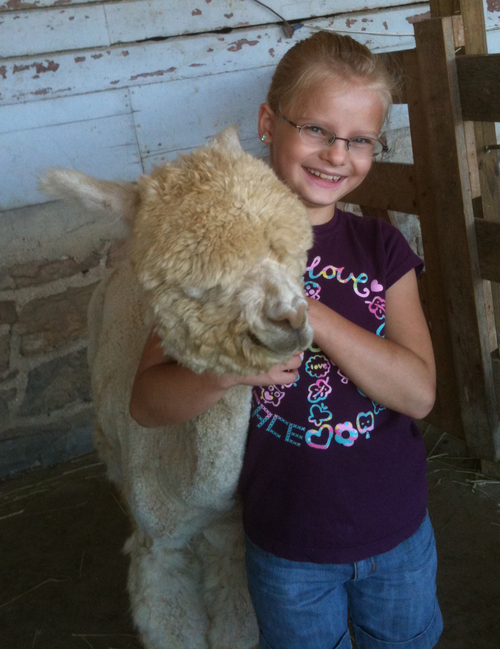 Ayla was sold to Sue and Harry Graver. Cloudy got his start about an hour before our annual open house began. It was great for the visitors to get to see a brand new baby that was just born, but since his mom was Sugar and she's none too fond of the humans - especially after she has a baby, we weren't able to interact with him too much that day. For some reason, he didn't start nursing like we had hoped, so he became a bottle baby - at least for a few days. Once he got the hang of it, he was fine. His name actually came from how he nursed - he was so tall that he'd get down on his knees and it looked like he was praying. So with his blinding white color, we called him Saint Cloud. He's turned out to be the friendliest alpaca we've ever had on the farm and he's one of my personal favorites. Doesn't hurt that his fleece is AMAZING! Sadly we lost our beloved Cloudy in the fall of 2012. He will always be a farm favorite and missed immensely.